Android android apps app review organize Review tips Wunderlist, Sunrise, and Google Now. What a trio! 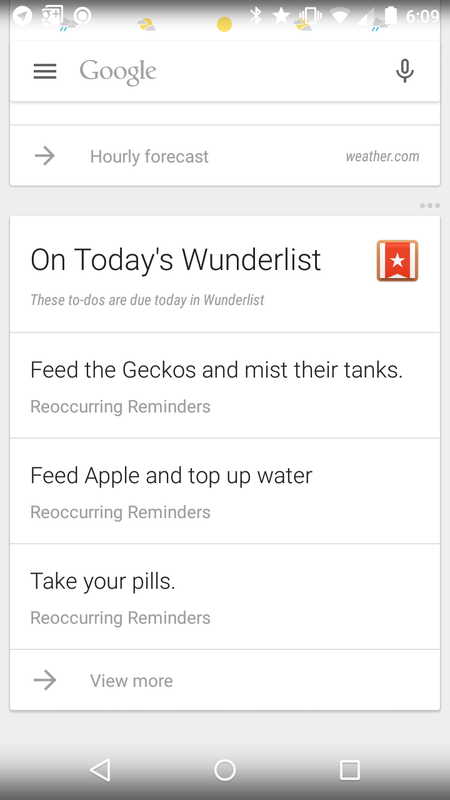 Wunderlist, Sunrise, and Google Now. What a trio! I have the memory of a goldfish. That means, I’d best set some reminders for myself, else nothing will get done. I have been trying various apps and methods to suit my needs. There are so many out there, it is very hard to settle on a select few. This is especially difficult when some features overlap between apps. To give some background, when it comes to having reminders, I have specific needs to suit my lifestyle. Reminders need to be repeatable for weekly, daily, etc. I had tried many, many apps to handle the above. Pushbullet, Inbox, Google Now, ToDoist, Evernote, Google Keep, and Wunderlist. 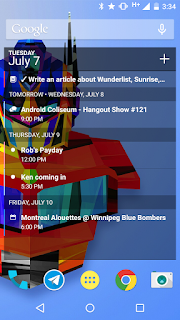 Wunderlist won, but only when it began to work with both Sunrise Calendar and Google Now. I’m always checking my calendar to see what’s next. Sunrise can access Wunderlist, and show specific lists you have. In my case, I have my Wunderlist inbox showing. Wunderlist also shows cards in Google Now. If I happen to be using Google Now, I can see my reminders and to-do’s (with deadlines) in a card. What I really love, is instead of saying, “Okay Google. 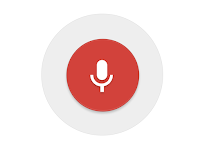 Remind me to call my wife at noon.”, I instead say, “Okay Google. Take a note. Call my wife at noon.” A new to-do is then added to Wunderlist’s inbox. I mentioned earlier I wanted notifications to show up on desktop. At home, I have Wunderlist installed, so the reminders show up there without a problem. At work, I still use Pushbullet to show the Wunderlist reminders. In case you were thinking that my notification shade (and therefore my Pebble Watch) was flooded with the same reminder 3 times, it is not. 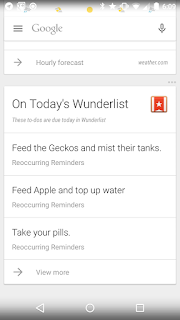 Google Now is showing a Wunderlist card, so that isn’t creating a notification reminder. Sunrise is only showing what’s in my Wunderlist inbox. No reminders from there either. Just Wunderlist. So what how do you organize yourself using your smartphone? What app, or app combinations do you use? Let me know in the comments below!